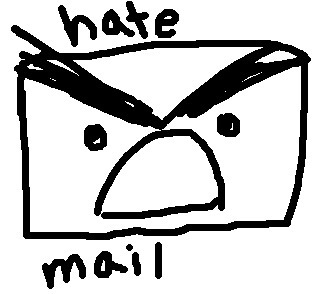 My guess is that no one who reads DigiDame has ever had to deal with hate mail on the Internet. It’s not that you are so perfect. It’s just that you play it safe. None of you would ever post a comment on Twitter or Facebook that would have provoked a mob of bullies to track you down. Justine Sacco, now the former communications director at InterActiveCorp (Barry Diller’s company), wishes she were one of you. I’m sure you heard about her In the last seven days. She was all over the news because of her foolish post on Twitter. Within minutes, Sacco started receiving the most damaging comments and death threats on Twitter and Facebook. She didn’t know about the reaction for the first eight hours because she was on a flight to London, her connection to Africa. When she arrived, she immediately saw the ruckus she had created. Sacco freaked and instantly wiped out all of her social media accounts. By the time Sacco reached Africa she had received word from IAC that she was fired. This all happened within a 24-hour period. It was like a Twilight Zone episode. She enters the aircraft one person and gets off another. I am told that Sacco is filled with regret and can’t sleep or eat. She is totally humiliated. She tries to keep strong for her family but she can’t hide the ache inside. We all make dumb mistakes. Sacco’s problem is that she chose the Internet to act like a clown. She forgot that she works for a high profile company where she is expected to display a certain amount of decorum at all times. Many of the folks on Facebook and Twitter make comments that they later regret. However, they can get away with it because they are not in the limelight. I got whacked four years ago after I sent an email to a blogger trying to make amends for pitching him too aggressively on a client’s product. He shared my letter with a much-followed industry personality who scolded me for my actions. Out of nowhere, I started receiving hundreds of emails telling me how pitiful I was. It was one of the darkest moments of my career. I was absolutely devastated by all of the anonymous people who came out of the woodwork to beat me up with their words. Apparently, there are thousands of people who are always on the Internet looking for a good fight. 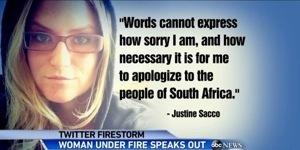 My recommendation to Justine Sacco is to keep apologizing, seek therapy, and then move on. It takes a long time for the hurt to go away, but it does.